Open up a 12" - 13" slit (or more if necessary) at the chosen location - cut against a slither of material (ply, etc.) so as not to damage the underlay beneath. Crop off any slate/tile nails that protrude through the batten. If the felt is over-tight and has to be ripped, or a cut is excessive, slip a suitable secondary length of material in loosely behind the underlay before positioning the vent. Slide the body of the vent into place so that the open area at the back of the unit faces into the batten cavity. 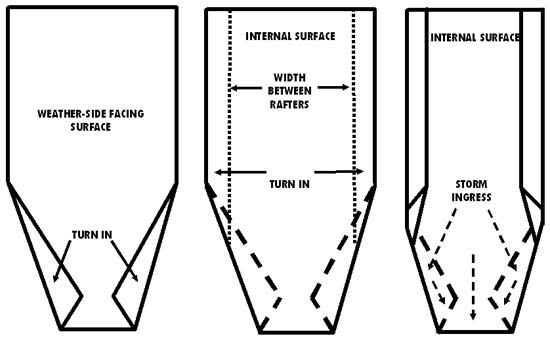 Cut and fold the replacement cover beforehand (see figure 6 below). Bring the loose ends of the cut together (tape or wire into place if preferred) and offer up the replacement cover making sure that the inverted folds of the lower end tuck down into the overlaying seam below. If not already fitted, insert the side clips to hold the felt tight against the body of the vent - staple or hold the cover in place and fix fastening battens tight up against the roofline and rafters. Trim off excess underlay and any dangling rafter strap - keep all work neat, tidy and weatherproof. The weather-side fold is done to divert any storm driven rain and snow that may find its way into the batten cavity. The folding and preparation of the replacement cover, as well as the sorting out of the fastening batten, is best done beforehand in more comfortable locations other than cramped loft spaces. The m3/h flow rate per lapVent - Building Research Establishment test figures. Out-flow = 11,326 mm2 at 10pa. In-flow = 10,540 mm2 at 10pa. Leading the field: lapVent is the first product on the market to undergo this stringent type of testing - in the future others will have to follow suit.